Some weeks ago I came across a Youtube clip in which the photographer used long exposure and flash together the create images of movement. The flat essentially froze the action at that point whereas the log exposure created the movement. I decided that this fitted in nicely with my earlier session using the LED lights and dancers which you can read about here. I had a large hall available and Kasia agreed to be my dancer. The key to the shot is getting a sufficient long exposure to allow enough light in to capture the movement, and the flash set to fire right at the end. I knew that I had to have a very wide depth of field as Kasia would be ranging over quite a large area. Therefore the camera was on a tripod and set at f20, with manual focus set with a test shot. 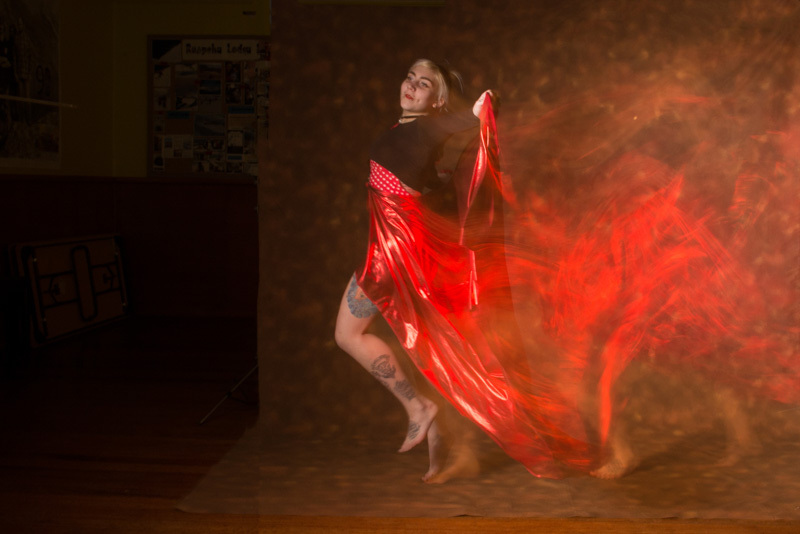 We initially started with a 1/3 second exposure but that didn’t generate enough movement so we extended that to 1 second. The ambient light was provided by the room lights, and my main flash was set to camera left using the 7 foot parabolic umbrella. I positioned a second light camera right with a small gridded reflector aimed at the backdrop to try to add some more separate. I had planned to bring in a constant light but in packing the car that got left behind. While I am reasonably happy with the end results I think that there were some definite things that I would change for the next shot. The first was to use a much bigger backdrop. I was using a very old support system and it is not that wide or tall. That meant that a number of great looking shots were not useable because Kasia had moved off the backdrop. I would remember to bring in all of the lights that i needed because the final image is well lit, the movement is a little dull. Timing is everything. Trying to start the movement with the press of the shutter is quite hard. As shown in the image below if Kasia held her initial position for two long we ended up with a double exposure. I am trying to arrange a time with a ballet dancer in the next month and hope to take this series further.